Following a triumphal six-month international tour and a Best New Comedy win at the What’s On Stage Awards 2014, The Play That Goes Wrong is now enjoying an extended run at the West End’s Duchess Theatre. The Play That Goes Wrong is a side-splitting farce about an amateur drama society’s attempts to stage a 1920s murder mystery play. The group of hapless thespians and backstage crew battle fudged lines, crumbling sets and disappearing props as they claw their way desperately to the final curtain call. The story of the play-within-a-play that goes hideously wrong has a long tradition in theatre, from Pyramus and Thisby’s attempted performance in Shakespeare’s Midsummer Night’s Dream to Michael Frayn’s hit Noises Off. Offering a flurry of sight gags and a hilarious script written by Henry Lewis, Jonathan Sayer and Henry Shields, The Play That Goes Wrong is a fantastic addition to this theatrical motif, exploiting the comic potential of theatrical misadventure to its absolute fullest. Deftly directed by Mark Bell and featuring excellent performances by the entire cast, including Charlie Russell as the lead actor and Nancy Wallinger as the much-beleaguered stage manager, this mischievous symphony of perfectly-timed theatrical disasters is sure to become a cult hit. BSL Interpreted performance on Thursday 2nd April at 7.30pm. If you choose post - tickets are sent 5 days after purchase. 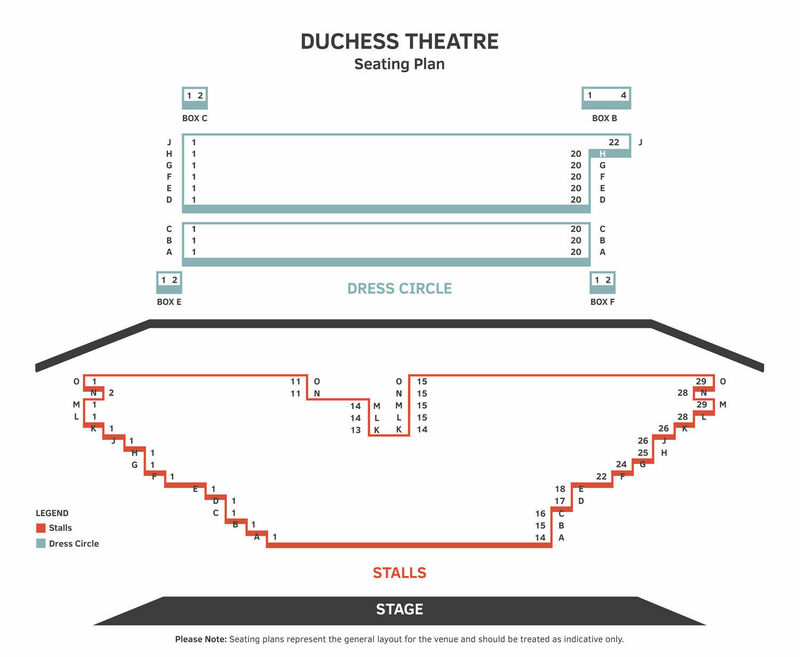 Duchess Theatre, 3-5 Catherine Street, London, WC2B 5LA. The Play the Goes Wrong is just right! The Play the Goes Wrong is a wonderfully British farce that apes a classic Agatha Christie type country house murder mystery. Really fun for all ages in a cozy theater on the West End. Loved it my cheeks hurt with all the laughter. Hi energy surprises everywhere ! Very funny and the actors work so hard ! The most I have laughed for 2 hours! Absolutely brilliant fun, the actors played their parts so well. The whole thing is put together brilliantly, really good fun production. I honestly do not think I stopped laughing for the entire 2 hours! This is an absolutely brilliant show; nothing could have prepared us for how clever and imaginative it is, let alone how funny. Tears of uncontrollable laughter.... Go and see it! It’s one of life’s treasures. Mrs B has already seen the show once and has been desperate to get me to the Duchess. I was not disappointed, there was non - stop entertainment from start (in the bar) until the end. Well done, we will be looking to book the Bank Robbery soon. As an ex Bank manager, I'm sure I will find lots to amuse me ! What a laugh, so well done. All the actors were fantastic. From the pre-show to the applause, this performance had me and my partner in hysterics! The mistakes that were made, made the mistakes that were made seem less like mistakes and more like making mistakes seem more like mistakes than they actually were (did that confuse you? Good!) The whodunnit aspect of the show was as enticing to us as the comedy and that's a difficult balance to strike with so much going on. The cast were absolutely positively brilliant! Slapstick meets sincere storytelling! Fun for everyone, extremely clever and an amazing show! Seen show before loved it, took the kids this time and they also really enjoyed it. Great evening. We laughed from the minute we got into the Theatre until the end. It was so obvious that the Actors were enjoying telling us the story The explanations from the Director/Inspector really set the scene. We loved the way the cast, spontaneously, interacted with us, the audience. I phoned the our Children straight away and they are going to try and book for their families. We highly recommend this play. We will definitely be back. I laughed once, well not laughed smiled.. !! I took my girlfriend who picked it out as something she had wanted to see.. I read the reviews and felt worth a go although I've never really found slapstick funny... and I'm sorry to say I still don't .. I do appreciate the effort put in by the actors ... I get the set is pretty clever .. .. but funny not for me I wish I'd taken my i-pod .. my girlfriend was glad she went and liked it but didn't love it... IF you want funny the book of mormon just up the road... we both laughed all the way through. Truly deserving of the "LOL" accolade. A talented cast that provided a splendid night's entertainment. Oh my goodness. We can not actually remember the last time we laughed so much. This is a must see. Will definitely be booking there other plays. Thank you. Quality time with my family, worth every penny!!!! Fantastic since the beggining to the very end, funny, smart, sharp on the details, fast pace comedy. Same company that runs the bank robbery, same fun both of plays. We laughed from start to finish! I wasn’t looking forward to this very much but a friend wanted to see it. I don’t like farce. I laughed the whole way through. The acting and sets were great. Go and see it wii won’t regret it. Laughed out loud from the start to the finish - brilliantly written and the cast were fantastic. Well worth a visit. Went to see this because it was highly reviewed. I thought it was awful & so did my friend. We were wondering why people around us were howling with laughter. Not once did we laugh & felt like walking out in the interval & having persevered to the end now wish we had! The comedy about a bank robbery was so funny so we just thought this one would be too. Total waste of our money & time. If you like dated slapstick comedy then maybe you'll enjoy it but wasn't our cup of tea at all. Simply loved it. A good old British farce brought up to date. And better for it The experience starts before curtain up so don’t be late. Absolutely brilliant I never laughed so much. The cast were very engaging with the audience, and had the crowd laughing from beginning to the end. Very enjoyable. Lot of laughs. Anything goes and also falls over. I will recommend it to my friends. The whole play was brilliant. Never laughed so much in one evening. Fantastic fun. I have never laughed so much! Everything from the start had us all in stitches and kept it up all the way through. I would have watched it again as soon as I left the theatre. We laughed from the moment we arrived, very clever and very entertaining. Everyone was very professional. A must see !! What a brilliant night. We laughed from beginning to end. Sooo funny. I genuinely have sore sides from laughing! Great fun from start to finish. We went as a group of 7 and everyone loved it. My brother in law said he couldn't remember the last time he had laughed so much. Do go to see this! Couldn't stop laughing from start to finish. Great show. Laughter from beginning to end. Fabulous show. We laughed from the moment of entering the theatre to the end of the show. A must see for all ages. Our 9 year old daughter loved it. Genius script, brilliant acting and my sides were aching through constantly laughing! Thoroughly enjoyed every minute! Fantastic play ! Very funny and very well done. We had a lovely time and would recommend to friends.